"SoHo" redirects here. For other uses, see Soho (disambiguation). The name "SoHo" refers to the area being "South of Houston Street", a name coined in 1962 by Chester Rapkin, an urban planner and author of The South Houston Industrial Area study, also known as the "Rapkin Report". [notes 1] The name also recalls Soho, an area in London's West End. SoHo is part of Manhattan Community District 2 and its primary ZIP Codes are 10012 and 10013. It is patrolled by the 1st Precinct of the New York City Police Department. Because of the nature of neighborhoods in New York City,[notes 2] different sources will often give different boundaries for each one. 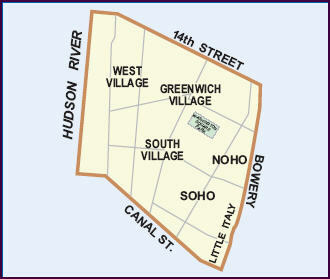 In the case of SoHo, all sources appear to agree that the northern boundary is Houston Street, and the southern boundary is Canal Street, but the location of the eastern and western boundaries is disputed. In 1974, shortly after SoHo first came into existence, The New York Times described the boundaries as "stretching from Houston to Canal Streets between West Broadway and Lafayette Street" – a definition it continued to hold to in 2016 – but The Encyclopedia of New York City reports that SoHo is bounded by Crosby Street on the east, and Sixth Avenue to the west. These are the same boundaries shown by Google Maps. However, the AIA Guide to New York City gives the western boundary of SoHo north of Broome Street as being West Broadway, and New York magazine gives the eastern boundary as Lafayette Street and the western boundary as the Hudson River. The map at the Community Board 2 profile page on New York City's official website has "SOHO" written near Broadway in the space roughly equidistant between Houston Street and Canal Street. In the 1990s, real estate agents began giving an adjacent neighborhood below West Houston Street various appellations, with no general agreement on whether it should be called (or included as part of) West SoHo, Hudson Square or the South Village. The AIA Guide calls that neighborhood "An intersection of brick and glass, searching for an identity", and refers to the western section of it as "The Glass Box District". Unlike Hudson Square, the South Village has traditionally appeared on maps of Community District 2, centered near the intersection of Houston Street and Avenue of the Americas. The more recent map of Community District 2 contains both the South Village and Hudson Square, with the latter written in the area below Houston Street, between Hudson Street and the Hudson River. The SoHo–Cast Iron Historic District is contained within the zoned SoHo neighborhood. Originally ending in the west at the eastern side of West Broadway and to the east at the western side of Crosby Street, the SoHo–Cast Iron Historic District was expanded in 2010 to cover most of West Broadway and to extend east to Lafayette and Centre Streets. The boundary lines are not straight, and some block-fronts on West Broadway and Lafayette are excluded from the District. During the colonial period, the land that is now SoHo was part of a grant of farmland given to freed slaves of the Dutch West Indies Company, and the site of the first free Black settlement on Manhattan island. This land was acquired in the 1660s by Augustine Hermann, and then passed to his brother-in-law, Nicholas Bayard. The estate was confiscated by the state as a result of Bayard's part in Leisler's Rebellion, but was returned to him after the sentence was annulled. In the 18th century natural barriers – streams and hills – impeded the growth of the city northward into the Bayard estate, and the area maintained its rural character. During the American Revolution, the area was the location of numerous fortifications, redoubts and breastworks. After the war, Bayard, who had suffered financially because of it, was forced to mortgage some of the property, which was divided up into lots, but even then there was very little development in the area, aside from some manufacturing at Broadway and Canal Street. Serious development of the area did not begin until the Common Council, answering the complaints of landowners in the area, drained the Collect Pond, which had once been an important source of fresh water for the island, but which had become polluted and rank and a breeding ground for mosquitoes. A canal was built to drain the pond into the Hudson, and the canal and pond were both later filled in using earth from nearby Bayard's Hill. Once Broadway was paved and sidewalks were built there and along Canal Street, more people began to make their homes there, joining earlier arrivals such as James Fennimore Cooper. 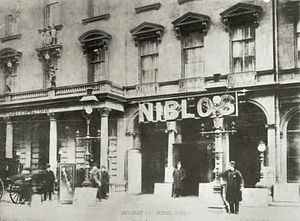 By the mid-19th century, the early Federal- and Greek Revival-style homes were replaced by more-solid structures of masonry and cast iron, and along Broadway, large marble-skinned commercial establishments began to open, such as Lord & Taylor, Arnold Constable & Company and Tiffany & Company, as well as grand hotels such as the St. Nicholas and the Metropolitan. Theatres followed in their wake, and Broadway between Canal and Houston Streets became a lively theater and shopping district and the entertainment center of New York; as usual with such areas, it was home to many brothels as well, and the side streets off of Broadway became the city's red-light district. As this change in character drove out the middle-class, their place was taken by small manufacturing concerns, including cabinet-makers and the lumberyards that supplied them, brass and copper firms, makers of china and glassware, locksmiths, snuff manufacturers and book publishers. This dramatic shift in the nature of the neighborhood continued to drive out residents, and between 1860 and 1865 the Eighth Ward, which included the SoHo area, lost 25% of its population. 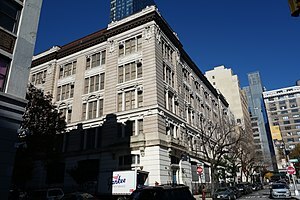 After the Civil War and the Panic of 1873, in the 1880s and 90s, large manufacturers began to move into the area, especially textile firms, and the area became the mercantile and wholesale dry-goods trade center of the city, and was the subject of significant real-estate speculation. This phase came to an end by the close of the 19th century, and as the center of the city continued to move uptown, the quality of the area declined. After World War II, the textile industry largely moved to the South, leaving many large buildings in the district unoccupied. In some buildings they were replaced by warehouses and printing plants, and other buildings were torn down to be replaced by gas stations, auto repair shops and parking lots and garages. By the 1950s, the area had become known as Hell's Hundred Acres, an industrial wasteland, full of sweatshops and small factories in the daytime, but empty at night. It would not be until the 1960s, when artists began to be interested in the tall ceilings and many windows of the empty manufacturing lofts, that the character of the neighborhood began to change again. SoHo boasts the greatest collection of cast-iron architecture in the world. Approximately 250 cast-iron buildings stand in New York City, and the majority are in SoHo. Cast iron was initially used as a decorative front over a pre-existing building. With the addition of modern, decorative facades, older industrial buildings were able to attract new commercial clients. Most of these facades were constructed during the period from 1840 to 1880. In addition to revitalizing older structures, buildings in SoHo were later designed to feature the cast iron. An American architectural innovation, cast iron was cheaper to use for facades than materials such as stone or brick. Molds of ornamentation, prefabricated in foundries, were used interchangeably for many buildings, and a broken piece could be easily recast. The buildings could be erected quickly; some were built in four months. Despite the brief construction period, the quality of the cast-iron designs was not sacrificed. Bronze had previously been the metal most frequently used for architectural detail. Architects found that the relatively inexpensive cast iron could provide intricately designed patterns. Classical French and Italian architectural designs were often used as models for these facades. Because stone was the material associated with architectural masterpieces, cast iron, painted in neutral tints such as beige, was used to simulate stone. There was a profusion of cast iron foundries in New York, including Badger's Architectural Iron Works, James L. Jackson's Iron Works, and Cornell Iron Works. Since the iron was pliable and easily molded, sumptuously curved window frames were created, and the strength of the metal allowed these frames considerable height. The once-somber, gas-lit interiors of the industrial district were flooded with sunlight through the enlarged windows. The strength of cast iron permitted high ceilings with sleek supporting columns, and interiors became expansive and functional. During cast iron's heyday, many architects thought it to be structurally more sound than steel. It was also thought that cast iron would be fire-resistant, and facades were constructed over many interiors built of wood and other flammable materials. When exposed to heat, cast iron buckled, and later cracked under the cold water used to extinguish fire. In 1899, a building code mandating the backing of cast-iron fronts with masonry was passed. Most of the buildings that stand today are constructed in this way. It was the advent of steel as a major construction material that brought an end to the cast iron era. In the 1960s, the SoHo area was to have been the location of two enormous elevated highways that comprised the two branches of the Lower Manhattan Expressway, a Robert Moses project that was intended to create an automobile and truck through-route connecting the Manhattan Bridge and Williamsburg Bridge on the east with the Holland Tunnel on the west. The young historic preservation movement and architectural critics, stung by the destruction of the original Pennsylvania Station in 1963 and the threat to other historic structures, challenged the plans because of the threatened loss of a huge quantity of 19th-century cast-iron buildings. When John V. Lindsay became mayor of New York City in 1966, his initial reaction was to try to push the expressways through, dubbing the project the Lower Manhattan Expressway, depressing some of the proposed highway in residential areas and stressing the importance of the artery to the city. Nevertheless, through the efforts of Jane Jacobs, Tony D'Apolito, Margot Gayle, and other local, civic, and cultural leaders, as well as SoHo artist residents themselves, the project was derailed. After the abandonment of the highway scheme, the city was left with a large number of historic buildings that were unattractive for the kinds of manufacturing and commerce that survived in the city in the 1970s. 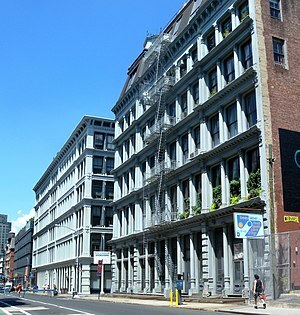 The upper floors of many of these buildings had been built as commercial Manhattan lofts, which provided large, unobstructed spaces for manufacturing and other industrial uses. These spaces attracted artists who valued them for their large areas, large windows admitting natural light and low rents. Most of these spaces were also used illegally as living space, despite being neither zoned nor equipped for residential use. This widespread zoning violation was ignored for a long period of time, as the artist-occupants were using space for which there was little demand due to the city's poor economy at the time, and would have lain dormant or been abandoned otherwise. 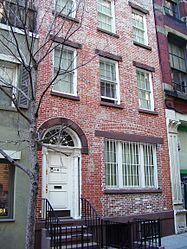 SoHo also contains former industrial buildings in other architectural styles, and is also dotted with smaller structures like this Federal style house built in 1819–20. Nevertheless, as the artist population grew, the city made some attempts to stem the movement, concerned about the occupation of space that did not meet residential building codes, and the possibility that the occupied space might be needed for the return of manufacturing to New York City. Pressured on many sides, and organizations such as the Artist Tenant Association and later the Soho Artist Association, the city abandoned attempts to keep the district as strictly industrial space, and in 1971, the Zoning Resolution was amended to permit Joint Live-Work Quarters for artists, and the M1-5a and M-5b districting was established to permit visual artists, certified as such by the Department of Cultural Affairs, to live where they worked. In 1987, non-artists residing in SoHo and NoHo were permitted to grandfather themselves, but that was the only extension to non-artists and was a one-time agreement. The area received landmark designation as the SoHo–Cast Iron Historic District in 1973. In 2005, the construction of residential buildings on empty lots in the historic district was permitted. Nevertheless, with no enforcement of the new zoning laws by the city, beginning in the 1980s, in a way that would later apply elsewhere, the neighborhood began to draw more affluent residents. Due to rent protection and stability afforded by the 1982 Loft Law, in addition to the fact that many of the artists owned their co-ops, many of the original pioneering artists remained despite the popular misconception that gentrification forced them to flee. Many residents have lived in the neighborhood for decades. In the mid-1990s, most of the galleries moved to Chelsea, but several galleries remain as of 2013, including William Bennett Gallery, Martin Lawrence Galleries, Terrain Gallery, Franklin Bowles Gallery, and Pop International Gallery. 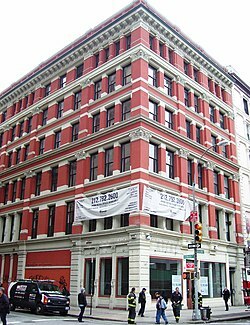 SoHo's location, the appeal of lofts as living spaces, its architecture, and its reputation as a haven for artists all contributed to this change. The pattern of gentrification is typically known as the "SoHo Effect" and has been observed elsewhere in the United States. A backwater of poor artists and small factories in the 1970s, SoHo became a popular tourist destination for people seeking fashionable clothing and exquisite architecture, and home to some of the most expensive real estate in the country. SoHo's chain outlets are clustered in the northern area of the neighborhood, along Broadway and Prince and Spring Streets. The sidewalks in this area are often crowded with tourists and with vendors selling jewelry, T-shirts, and other works. SoHo is known for its commercialization and eclectic mix of boutiques for shopping—although in 2010, it had twice as many chain stores as boutiques and three times as many boutiques as art galleries. For census purposes, the New York City government classifies SoHo as part of a larger neighborhood tabulation area called SoHo-TriBeCa-Civic Center-Little Italy. Based on data from the 2010 United States Census, the population of SoHo-TriBeCa-Civic Center-Little Italy was 42,742, a change of 5,985 (14%) from the 36,757 counted in 2000. Covering an area of 581.62 acres (235.37 ha), the neighborhood had a population density of 73.5 inhabitants per acre (47,000/sq mi; 18,200/km2). The racial makeup of the neighborhood was 66.1% (28,250) White, 2.2% (934) African American, 0.1% (30) Native American, 22.2% (9,478) Asian, 0% (11) Pacific Islander, 0.4% (171) from other races, and 2.6% (1,098) from two or more races. Hispanic or Latino of any race were 6.5% (2,770) of the population. SoHo and Greenwich Village generally have a higher rate of college-educated residents than the rest of the city. The vast majority of residents age 25 and older (84%) have a college education or higher, while 4% have less than a high school education and 12% are high school graduates or have some college education. By contrast, 64% of Manhattan residents and 43% of city residents have a college education or higher. :6 The percentage of SoHo and Greenwich Village students excelling in math rose from 61% in 2000 to 80% in 2011, and reading achievement increased from 66% to 68% during the same time period. The Montessori School in Soho is located at 75 Sullivan Street. The New York Public Library's Mulberry Street branch is located at 10 Jersey Street. The library occupies three floors of a former chocolate factory in SoHo, including two basement levels. SoHo can be reached by the New York City Subway, using the A, ​C, and ​E trains to Spring Street; 1 and ​2 trains to Houston Street; the N, ​Q, ​R, and ​W trains to Prince Street; and the 4, ​6, and <6> trains to Spring Street. The crosstown M21 on Houston Street and the north-south M1, M55 bus routes also serve the neighborhood. ^ The coining of "SoHo" for "South of Houston" began a naming convention that became a model for the names of emerging and re-purposed neighborhoods in New York such as TriBeCa for "Triangle Below Canal Street", DUMBO ("Down Under the Manhattan Bridge Overpass"), NoHo ("North of Houston Street"), NoLIta ("North of Little Italy") and NoMad ("North of Madison Square"), among others. 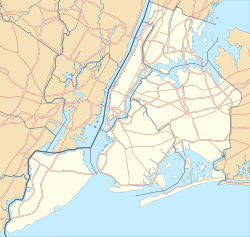 ^ Neighborhoods in New York City do not have official status, and their boundaries are not specifically set by the city, although the boundaries of related areas, such as zoning districts and historic districts are set and specific. Because of this, the definition of where neighborhoods begin and end is subject to a variety of forces, including the efforts of real estate concerns to promote certain areas, the use of neighborhood names in media news reports, and the everyday usage of people. ^ a b c d "Soho neighborhood in New York". Retrieved March 18, 2019. ^ As in, for example, "Soho, New York, guide: The best of the neighborhood". Time Out New York. Retrieved 2013-12-27. Sweeney, Sean (October 17, 2013). "Secret vote on the Soho BID was some tricky business". The Villager. Greenwich Village, New York City. Retrieved 2013-12-27. Strickland, Julie (October 18, 2013). "Soho BID gets green light amid community opposition". New York City: TheRealDeal.com. Retrieved 2013-12-27. ^ Soho Cast-Iron Historic District Archived 2011-06-05 at the Wayback Machine, National Park Service, n.d. Accessed 2011-03-26. ^ Scherzer, Kenneth A. "neighborhoods" in Jackson, Kenneth T., ed. (2010), The Encyclopedia of New York City (2nd ed. ), New Haven: Yale University Press, ISBN 978-0-300-11465-2 , pp.886-87. Quote: "Most neighborhoods in New York have a generally recognized central district, but their boundaries are difficult to define, especially if the population is transient and heterogeneous, the neighborhood is centrally situated, or the question of boundaries is politically sensitive ... Perceptions play a large role in shaping the evolution of neighborhoods: areas that are perceived as desirable tend to grow and prosper, which in turn makes them more desirable. At the same time the boundaries of a prosperous neighborhood inevitably expands, which serves the interests of residents of adjoining areas, of real estate brokers and speculators, and sometimes of government. A similar process works in reverse to the detriment of declining neighborhoods. Sometimes neighborhoods are renamed in an effort to improve their image." ^ a b Community Board No. 2, Manhattan, New York City. 2014. Accessed April 5, 2019. ^ Let Your Voice Be Heard: A Guide to Manhattan's Community Boards, map, June 3, 2006. ^ New York City Landmarks Preservation Commission "SoHo–Cast Iron Historic District Extension Map"
^ "West Broadway: once a slum called 'Rotten Row'". Ephemeral New York. 2011-03-16. ^ Anderson, Steve. "Lower Manhattan Expressway (I-78 and I-478, unbuilt)". NYCRoads. Retrieved April 29, 2013. ^ a b Dunlap, David W. (September 29, 2008). "Remembering a Pioneer of the Preservation Movement". The New York Times. Retrieved 2017-10-18. ^ "Zoning Resolutions: The Soho Artists and the Making of Urban Policy, 1961-1971 (2017)"
^ Zezima, Katie (August 10, 2004). "Artistic Enclave Gets Its Footing In Rhode Island". The New York Times. Retrieved 2013-12-27. ^ Miller, Sara B. (September 28, 2004). "In New England, a city revival built on creativity". The Christian Science Monitor. p. 2. Retrieved 2013-12-27. ^ "America's Most Expensive ZIP Codes". Forbes. Retrieved 5 April 2013. ^ Powell, Michael (Feb 21, 2010). "A Contrarian's Lament in a Blitz of Gentrification". The New York Times. ^ a b c d e f g h i j k l m n o "SoHo and Greenwich Village (Including Greenwich Village, Hudson Square, Little Italy, Noho, Soho, South Village and West Village)" (PDF). nyc.gov. NYC Health. 2018. Retrieved March 2, 2019. 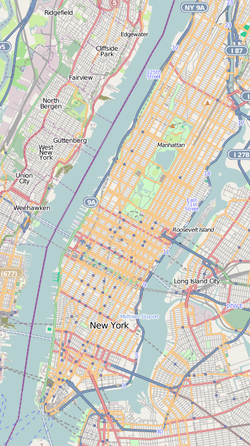 ^ "Soho, New York City-Manhattan, New York Zip Code Boundary Map (NY)". United States Zip Code Boundary Map (USA). Retrieved March 21, 2019. ^ "Welcome - Broome Street Academy Charter School - M522 - New York City Department of Education". Retrieved 16 April 2017. ^ "Welcome - Chelsea Career and Technical Education High School - M615 - New York City Department of Education". Retrieved 16 April 2017. ^ "NYC iSchool". Retrieved 16 April 2017. ^ "Welcome - P.S. 130 Hernando De Soto - M130 - New York City Department of Education". Retrieved 16 April 2017. ^ "School website". Retrieved 16 April 2017. ^ "About the Mulberry Street Library". The New York Public Library. Retrieved March 9, 2019. 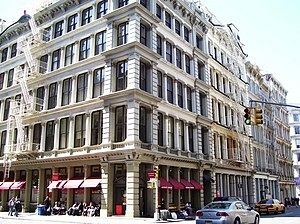 Wikimedia Commons has media related to SoHo, Manhattan. Wikivoyage has a travel guide for Manhattan/SoHo.